Known as Guy Fawkes Night, Bonfire Night, Firework Night, Pope Day, or Gunpowder Treason Day, the 5th of November marks the anniversary of a failed attempt to kill the Protestant King James I in 1605. 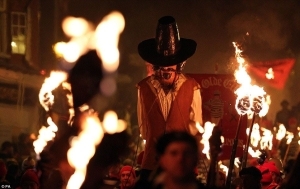 The first celebrations mark a thanksgiving of the arrest of Guy Fawkes and the survival of James. The public was allowed to rejoice with bonfires and newly written prayers. At one point, it became common to burn effigies of such figures as the pope, Guy Fawkes, the devil, the Whore of Babylon, and more recently Lance Armstrong and Vladimir Putin.